Bright and fun jungle buddies! 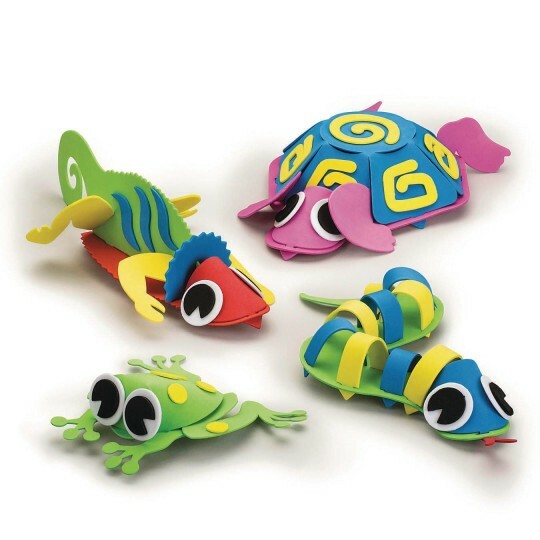 Measures 6" x 5" to 11" x 5"
Bright and fun jungle buddies! 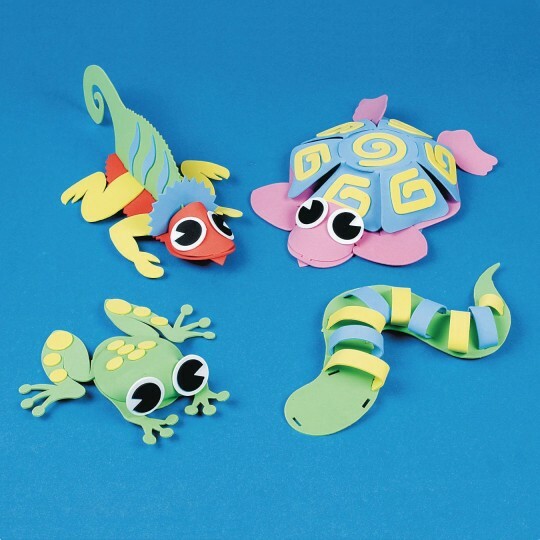 Frog, chameleon, snake and turtle. 3 each. Includes assorted foam pieces, glue and instructions. Approx. 6" x 5" to 11" x 5". IHIS IS AWESOME!!!! OUTSTANDING ITEM!!! I bought these to use at a day camp for ages 7-9. The kids enjoyed putting them together and showing the craft to their parents at the end of the day. It did not come with the lizards which was apparently a packing mistake but that was okay because I still had enough for the camp. They are cute in a cartoonish way. I'm not sure how well they will hold up to kids playing with them. Great craft. We use it in our summer camps to learn about reptiles. I have to admit the snake is not very popular so I just buy extra kits and don't use the snake for camp. We use this craft every year for our zoology camp. They are colorful easy to put together and the kids love them! So much fun the kids all got to make four critters. The directions were easy to follow and the k-5 group needed minimal help!